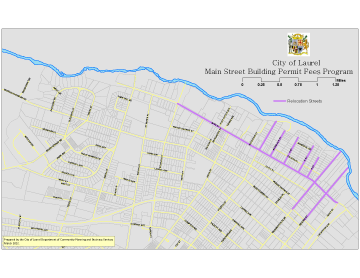 As part of the City of Laurel Economic Development Program, Mayor Craig A. Moe has adjusted the Department of Community Planning and Business Services fee schedule to reduce the filing fees for Commercial Building Permits, Use and Occupancy Permits and Sign and Banner permits for the period May 1, 2012 through April 30, 2014 for certain properties in the Main Street Area. The Main Street Area is described as Main Street from First Street to Seventh Street, and includes Main Street’s side streets from U. S. Route 1 North to Fourth Street, north to the Patuxent River, and Route 1 north from Montgomery Street to the Patuxent River. The goal of this change is to assist a new or an existing business relocating to the Main Street area by a reduction in permit costs. The City’s interest in assisting new and relocating business is to help business succeed and grow and continue to provide local jobs and create new jobs for residents of the City of Laurel area. 1. Eligibility. Property owners and tenants, who own properties and/or businesses with in the Main Street area, are eligible to apply under the Program. A business owner who is leasing space must have a current lease and obtain written approval from the property owner to participate in the Program and proceed with the improvements. 2. Eligible Projects. Properties must be located on Main Street area as described as Main Street from First Street to Seventh Street, and includes Main Street’s side streets from U.S. Route 1 North to Fourth Street, north to the Patuxent River, and Route 1 north from Montgomery Street to the Patuxent. 3. Design Review. Exterior and improvements must be approved by the Historic District Commission for appropriateness. The applicant must meet with Community Planning and Business Services Department to determine required permits. 4. Occupancy. Once the project has been completed, the property must be eligible to obtain, or already have a Use and Occupancy Permit. Please call (301) 725-5300 ext. 2252 or 2314 for further information, copies of any documents, or to set up an appointment.